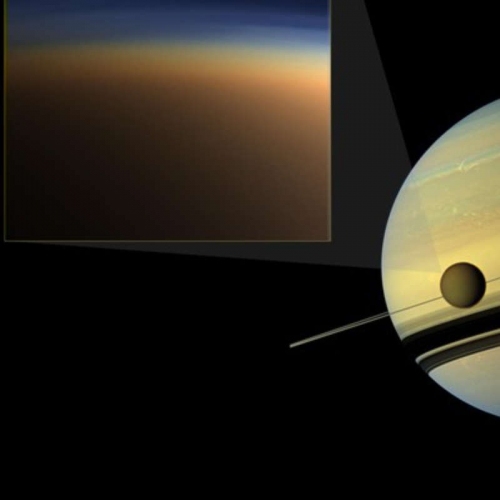 Saturn’s largest moon, Titan, is unique among all moons in our solar system for a dense and nitrogen-rich atmosphere that also contains hydrocarbons. The story behind the formation of this rich chemical mix has been the source of scientific debate for decades. A research collaboration, involving scientists in the Chemical Sciences Division at the Department of Energy’s Lawrence Berkeley National Laboratory (Berkeley Lab) and led by University of Hawaiʻi at Mānoa Professor Ralf Kaiser, has zeroed in on a low-temperature chemical mechanism that may have driven the formation of multiple-ringed molecules—the precursors to more complex chemistry now found in the moon’s brown-orange haze layer. The team also included researchers from Samara University in Russia and Florida International University. The study, published in the October 8 edition of Nature Astronomy, runs counter to previous theories that high-temperature reaction mechanisms are required to produce the chemical makeup that satellite missions have observed in Titan’s atmosphere. The team used vacuum ultraviolet light experiments at Berkeley Lab’s Advanced Light Source (ALS), together with computer simulations and modeling work to demonstrate the chemical reactions that contribute to Titan’s modern-day atmospheric chemistry. Benzene, a simple hydrocarbon with a six-carbon single-ring molecular structure, has been detected on Titan and is believed to be a building block for larger hydrocarbon molecules with two- and three-ring structures that, in turn, formed other hydrocarbons and aerosol particles that now make up Titan’s atmosphere. These multiple-ring hydrocarbon molecules are known as PAHs. In the latest study, researchers reacted two chemicals—a short-lived two-ring PAH and a hydrocarbon—at the ALS, and produced three-ring PAHs in the process. Both of the molecules used to drive the reaction are inferred to exist on Titan based on what is known about the chemical makeup of its atmosphere. Read the full news release for more on the discovery.